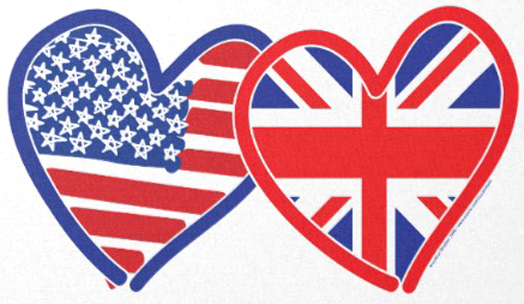 America and England don’t seem, at first, particularly different. Sure one is nearly the size of a whole continent, and the other is a tiny island off the coast of mainland Europe. But we both speak the same language, enjoy the same things, eat the same foods, have similar political systems, and so on. But there are subtle differences, and it might not be until you date someone from the other side of the pond, that you really begin to notice them.Supermarket shopping, for example, is an area where there is significant difference. Chelsea has recipes that she enjoys cooking at home, and wants to cook in England too. But the moment she starts to write the list of ingredients, a puzzled look often crosses my face. Crushed tomatoes… what are those? Oh, it’s tomato passata . But tinned, diced tomatoes with green chilli’s? That’s not something that you’ll find in England. And, for that matter, why call an onion, a yellow onion? What other type of onion is there? Some English & American Spelling Differences. And Chelsea will often tell me, too, that a way I am behaving, or something that I say is a typically ‘English’ thing to do. And I’ll respond with “What do you mean, everyone does that? Don’t they?”It’s not until that you start to date someone from another country that you become aware of the mannerisms and little quirks that define your nationality, and how, even in two very similar countries there are fairly significant differences. But, this is by no stretch a bad thing. It is fun to learn the things that you do that your partner thinks are strange. To get an outside perspective on the world. It prevents you from having too much of a narrow world view, and really opens your eyes to the fact that no matter how similar you may be, there are differences everywhere. Similar enough to agree, different enough to be interesting, is what I usually tell Chelsea. And it’s true. While we often tease each other and joke about these differences, we are still grateful that they were there. Because in life you should always look for the person who mirrors your personality, who reflects what you are, and complements you. Don’t spend your time looking for someone who is exactly the same as you. Similar enough to agree, different enough to be interesting.I consider myself extremely lucky that I found Chelsea (or she found me as the case may be). And I am blown away that we gave dating a shot and found out that we aren’t the same, that we have little differences, but that we cherish those, expanding each other’s world view. And knowing that deep down, the little differences don’t matter, because at the end of the day, I love Chelsea, and that will over-ride everything. I am glad we have the little differences between us. But I am more glad that we love and cherish each other. And that is something that will never change.